Wikki Stix, pipe cleaners, and bottles of puffy glue cover laboratory tabletops as students twist, press, loop and stick objects together. With a glimpse into one of Richelle Monaghan’s Molecular Biology classes at Wilfrid Laurier University’s Brantford campus, the uninitiated may mistake it for an arts studio. What they’re actually witnessing is an altered approach to teaching; an approach chronicled in a tactile poster that recently earned honourable mention for the Mick Burt Award at the Canadian Society of Zoologists conference. Like many science professors, Monaghan historically relied upon a library of diagrams and illustrations to convey concepts during lectures. That standard approach changed when Kylie Caplan, a blind student at Laurier’s Brantford campus, enrolled in the university’s Public Health program. Working in close consultation with Caplan, Monaghan modified her teaching approach. As it turns out, the changes benefited not only Caplan, but her sighted peers as well. 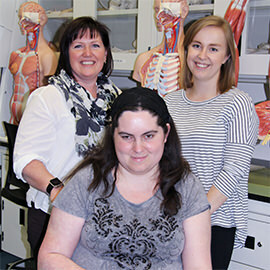 Caplan, her fellow student and lab partner Clare Fletcher, and Monaghan recounted their journey on the accolade-receiving poster – complete with a Braille overlay – titled Pedagogical Approaches to Post-secondary Biological Sciences for the Blind. The trio posits that post-secondary science programming hasn’t addressed accessibility for the blind, because visually impaired students are often encouraged to pursue other fields. That was Caplan’s experience when she attended a school for visually impaired, blind and deafblind students. With a small student body – only about 100 students enrolled in secondary classes when Caplan attended – course offerings were limited. Caplan received permission to register for the Biology 110 course at Laurier, which opened the doors for her to register in other science courses, including anatomy, physiology and molecular biology. Working around the traditional emphasis on visual aids to teach these subjects became a work in progress for Monaghan. As Monaghan verbally described in detail the diagrams and illustrations she uses in her teaching for Caplan’s benefit, she had an epiphany: just because her sighted students were able to see the images, it did not necessarily mean they understood them. Discussions with her students revealed that the illustrations were not always effective. Thanks to Monaghan’s elaborate descriptions, sighted students experienced many “aha” moments when they went from seeing the image to understanding the concept. Monaghan also engaged in hands-on model making. She set aside three full lecture periods for students to make pipe cleaner models of the human circulatory system. Despite initial concerns about committing so much class time to one topic, Monaghan’s students reported that the exercise engaged multiple parts of their brains at once, causing them to fully understand and retain the information they learned. Both Caplan and Fletcher graduated at Laurier’s June 8 convocation ceremony. Armed with their degrees in Public Health Studies and their honourable mentions from the Canadian Society of Zoologists, both are going on to pursue additional education. Caplan successfully wrote the MCAT (Medical College Admission Test) exam, but has chosen to attend Humber College’s post-graduate program in Clinical Research, where she will continue to explore circulatory and respiratory systems. Fletcher will attend McMaster’s Accelerated Bachelor of Science Nursing program. For her part, Monaghan has forever changed how she teaches some of her core subject matter. She also predicts that in the future there will be even more demand for science programs to be made accessible, a feat that requires collaboration, creativity and imagination, but provides benefits that are universally experienced by all students.